So with the big hoopla in the media this week about Kelly Clarkson and her (gasp) weight (is it anyone one else’s business but hers?) it really stirred up a topic that’s been rolling around in my head for awhile to write on and this was just the catalyst to let it out. No, not her weight. Not yours or mine or the family dogs. Actually, this has nothing to do with that topic. I was more impressed and high fiving her for her ” I don’t care what you or anyone else thinks, I’m awesome” attitude and comment over that issue. Approval. She pretty much thumbed her nose at the idea she needed someone else’s approval to be happy and be herself. Kudos to you Kelly. We come into this world almost wired for it. In the beginning it’s our parents/ family, we get in school it becomes our peers, later it becomes our boss, co-workers, friends, still family, sometimes even perfect strangers. If we’re fortunate as we grow up and mature becoming more comfy in our own skin and who we are, we become less concerned over the need for approval of others. I mean really, at the end of the day, approval given is based on personal opinions, values, beliefs, how we were raised, and even what our personalities are. I was recently chatting with a young friend who was expressing to me the idea of doing something and I said… “well, just do it”. His response was… “yeah, but I just worry about what other people are gonna think”… I laughed and told him I didn’t care anymore…. He responded with… ” yes, but you’ve had more life experience to get to that point” and he’s right. I have lived enough life to get to that point. I’m grateful for that ’cause honestly, it’s total freedom. 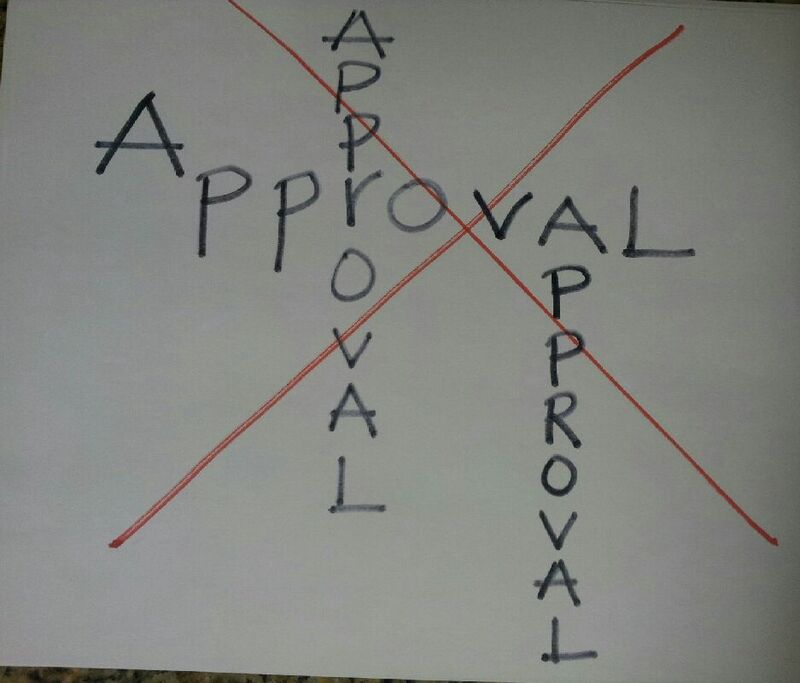 My “approval needed” list is tiny, one digit, small now days. I reminded him that approval can be subjective, or it can be a “control” thing with some people. Withholding approval, not giving it, can often be a silent way of expressing personal displeasure, which is then projected onto the person. Basically, their way of saying they don’t like what you’re doing or have done or that they wouldn’t do it . As stated above, that would be based on personal feelings, beliefs, values, etc. I reminded him that it can be those closest to us who might withhold it but if he wanted to grow and move forward, he’d need to live his own life and pursue his own dreams. It can be a hard step to move into. But it’s also seriously freeing. You have your own life to live….. to be yourself. You don’t need approval to embrace your life and live it to the fullest being who you are. Next Next post: You Run What ? ?